Social Media: Generation C - The implications for researchers, marketers and advertisers. Generation C: What do you understand of this terminology? What is the first thing that comes to mind? Does it mean 'consumer', 'connected', 'creation', 'content', 'conversation', 'community', 'customise', 'curiosity', 'communication', or something else perhaps? The characterisation of "Gen C" has evolved over time and is still a widely debated topic. However from a psychographic point of view, "Generation C" can be summarized as the digital natives who share information with people like friends, family, colleagues and consumers through the use of content (RSS, blogs, Podcasts, Wikipedia, YouTube, social bookmarking, etc.) and communities (social networking, forums, etc)1. Social technologies have directly influenced how this generation socialises and interacts. How they gather and consume information, engage in their daily activities or choose their products and services. Consumer-to-consumer - By e-word of mouth (e-WOM), consumers are now gaining more control by driving conversations with or without direct input from brands. Business-to-consumer - Many businesses are jumping aboard the bandwagon in the rush to integrate social media into their overall marketing activities, thus revolutionizing the way they communicate with consumers and subsequently grow their businesses. In Asia for example, Foursquare provides location-based apps to Topshop and Topman the fashion retailer to offer check-in promotions in an attempt to engage in a more rewarding shopping experience with their target group. Social listening via brand communities - Businesses are discovering new and potential ways to target and research niche markets. Through the use of online community technology they are able to both assist in the development of new products and services, also giving their consumers a voice and actively engaging with them. Web scraping - A process whereby content and media files are mined from numerous social media sites, blogs and forums to generate unstructured, albeit valuable, insights around an organisation's brand, product or service. Even information seeking tasks are also being redefined via online Q&A technology like Quora, Facebook Questions, Asks.com and Google's Aardvark. ROI measurement - It has become increasingly important to measure return on investment via social media. By selecting the social media platform relevant to your business, and then tracking of sales generated from online activities such as visitors to your website, followers via 'branded' Facebook or Twitter pages, online display advertising and campaigns, e-WOM and blog comments regarding your brand, product or service, etc. Increasing brand conversion and loyalty and thereby increasing sales and profits represents a positive ROI via a social media approach. Online commercialisation - Interactive ads via various social media platforms are on the rise. According to ZenithOptimedia2, online video and social media are now key portals for display advertising within the internet category, with a forecasted 33.9% contribution to the internet ad-spend in 2010 and 35% in 2013. Campaign dynamism - Building brand awareness via social media directly benefits search engine ranking and exposure, which is therefore capable of turning what started as local campaign into a global phenomenon due to the spillover effect of online dialogues. One of the examples is the 'Old Spice' online ad campaign - a male grooming brand by Procter & Gamble which accumulated close to 6 millions of video views within 24 hours and generated 22,500 comments. Social bookmarking sites - Digg, Delicious, etc. Looking at Asia Pacific (APAC) in particular, let's explore in more detail the social networks that are prevalent within this region. 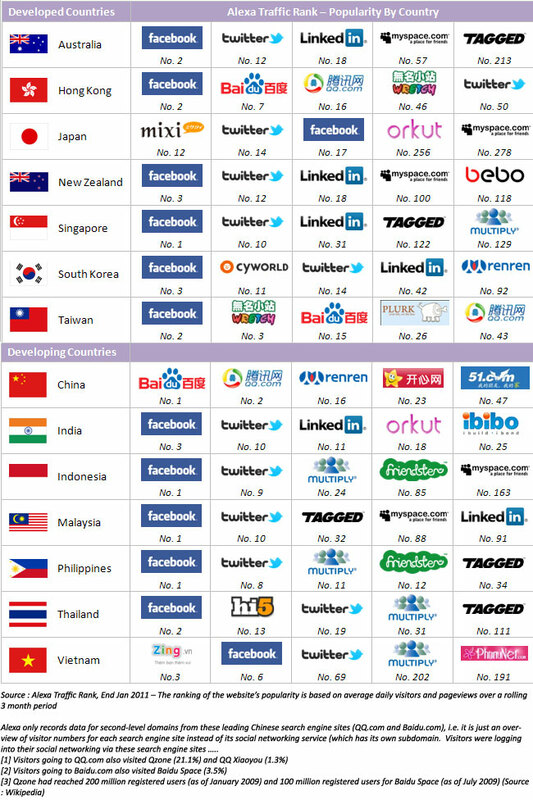 Popular Social Networking Sites : The below table summarises the Social Media brand hierarchy within APAC. The data presented being was obtained from Alexa Traffic Ranking, with the ranking for each of the website's popularity based on average daily visitors and pageviews over a rolling 3 month period. As of January 2011, we can see Facebook was the dominant social network site in the APAC region, as it is worldwide. Doing some online shopping at eBay, Amazon, etc. With the fast-changing online environment, conducting a tracking study will be helpful in order to understand the online activities of your target audience, their involvement in social media space and monitoring the influence of technologies on them. Trend analysis via ''Google Trends" and ''Google Insights" - can offer a quick snapshot of general market trends using a collation of keyword search data over a period of time. This can be anything from brands, news, events, online commercials, etc. By categorising the data by countries, cities and languages organizations can detect a growing trend, indentify new opportunities for their product lines and uncover unmet needs within a market. Each method has its own intrinsic benefits and the challenge is to have the right blend of expertise and resources to gather quality contents. Content analysis - To provide an holistic view of your brand, product or service, looking at variables such as general awareness, share of attention in social media (e.g. potential reach across different online channels or sites, number of recommendations / referrals you received, users bookmarking your content), and thus keeping track of relevant conversations and associations. It is now more difficult to provide assurances around issues such as privacy, citing and referencing of online sources, monitoring of legal ages for participation in online research-related activities, etc. It can help create an interactive and engaging relationship, one that gains, and more importantly retains, mindshare from consumers through increased brand interaction and association, as well as maintaining stronger connections and loyalty amongst its consumers and brand loyalists. With a wide range of standard and customized demographic measurements, targeted profiling can be effortlessly undertaken to quickly establish sub-panels for a range of specific research topics and cost effectively controlled for a multi-country study. Researchers can easily access a sample to match a specific objective. They can also benefit from quick turnaround times on reliable research data and insights via an interactive and secure survey environment. In short, an online community with a well-defined strategy can prove to be an invaluable tool in researching your goals and uncovering new market insights, thus assisting your organization in the realization of their strategic objectives. Conclusion Looking forward is it possible to conceive that social media could become the future vehicle of market research? Presently from a research point of view, social media is best used for directional information around your business strategies, preliminary testing before implementing your marketing mix, or to develop your research hypotheses and benchmarking before execution. Already social media has become an integral part of the toolkit to enlighten modern market research practices and challenges, offering genuine insights that are aligned to best practice from a research and data collection perspective. Dan Pankraz - Planning Director / Youth Marketing Specialist at DDB Sydney : Gen C Mantra: "I share, therefore I am"
Jake Pearce - UK Marketing Strategist : Gen C, Gen Y, Gen Who?